Snagov (population: 6,041) is a commune, located 40 km north of Bucharest in Ilfov County, Romania. 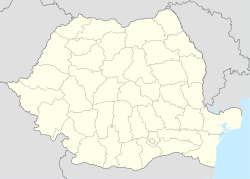 According to the 2002 census, 99.2% of the population is ethnic Romanian. The commune is composed of five villages: Ciofliceni, Ghermănești, Snagov, Tâncăbești and Vlădiceasca. Snagov is a tourist and spa resort - but the necessary infrastructure has regressed after 1989. The Snagov name is of probably Bulgarian origin, from the word sneg (meaning "snow") or snaga, meaning "human body". Snagov is located in Romanian plain, on the shore of Lake Snagov (biggest natural lake from Romania: 600 sq ha, 16 km long) which is still partially surrounded by old oak forest (remains of Codrii Vlăsia). Archaeologists confirmed human presence of inhabitants since 400 BC. Snagov village was built around Lake Snagov and Snagov monastery, founded in the late 14th century on an islet in Lake Snagov, about 2 km north of Snagov village. The first written record of it is found in a document from the court of Mircea cel Bătrân and dated 1408. Snagov monastery was excavated in 1933 by archaeologist Dinu V. Rosetti. Cultural attractions are mainly formed by: Snagov monastery, Snagov Palace, few monuments, Colecțiile Muzeale Snagov, a set of four local traditions (fishing, braiding of vegetable fibers, pottery, traditional fabrics). Natural attractions are associated with the two protected natural areas Snagov Lake (100-150 ha) and Snagov Forest (10 ha) (see Law 5/2000) included in the Snagov Natural Complex Reserve with an area of ​​1147.7 ha established by HCM 894 / 1952 which includes all the forests on the shore of the lake. 25.06.1933 - The National Celebration of Water day (Carol II of Romania, Michael I of Romania, Nicolae Iorga, Iuliu Maniu, Dimitrie Gusti and many other top officials - plus Liga Navală Română, Cercetașii României and representatives of local community. This is the reason for celebrating the day of the lake Snagov on 25.06 (when Romanians also celebrate "Sânzienele / Drăgaica"). 23.08.1945: Ion Antonescu left Snagov Palace in order to go to Bucharest at the request of Michael I of Romania, when and where he was arrested, Manfred von Killinger (also staying at a nearby villa on the shore of lake Snagov), soon committed suicide (because he failed to maintain Romania on the side of Germany - as requested by Hitler). 2002: Romanian government decides to build in Snagov a Disneyland-style theme park, "Dracula Park", but in 2006 the government canceled the project. The connection with "Dracula" is due to a spurious 19th-century tradition which makes Snagov monastery the site of the tomb of Vlad III Dracula. 4-5.04.2003: Snagov holds (at Palatul Snagov) the informal meeting of the first ministers of the seven states invited to join NATO. 2008: A pedestrian footbridge is struck by a tipper lorry and is lifted, then collapsing onto a moving car, killing a 21-year old woman driving towards Bucharest. The footbridge has not been rebuilt since, and the stairways were left as a memorial to the death of the victim, but they are also pending reconstruction. 2016: Protection on natural area (heritage) was reinforced by "The management plan and the ANPLS regulation" published in the Official Gazette no. 380bis of 18.05.2016. Romanian president Nicolae Ceaușescu and his entourage used Snagov as a vacation retreat. Over 50 heads of state, prime ministers, top politicians from more than 40 states, walked on lake Snagov with the "Snagov 1" luxury boat (today called "Leader"). In Snagov came at film studios Castel Film Romania were produced over 250 films. In the Snagov Museum Collections are presented about 130 personalities related to Snagov. Initiated but not yet implemented - with: Port of Le Havre from France and Sarkad from Hungary, Gandiaye village from Senegal. Siliștea Snagovului, a church built in 1664. The Imre Nagy monument. The prime minister of Hungary was kept for a few months in Snagov before being sent to trial and executed in Budapest. Stadionul Snagov, a football stadium seating 2,000. Near Tâncăbești, there is since 1949 a medium wave broadcasting station, which uses as antenna a 187 meters tall guyed mast radiator. Tâncăbeşti transmitter, which works on 855 kHz used before the 1990s a transmission power of 1500 kW. Today it may be 300 kW.